Viper 4-Stroke Exhaust cans utilise optimum stainless steel steel components offering an aftermarket exhaust can with top build quality and performance. 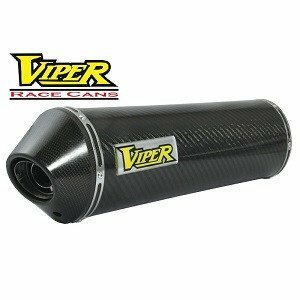 Viper cans are available in a range of lengths, shapes and materials such as carbon fibre, meaning there is a can for everyone! Available as Road Legal E marked baffled cans or unbaffled track use cans. 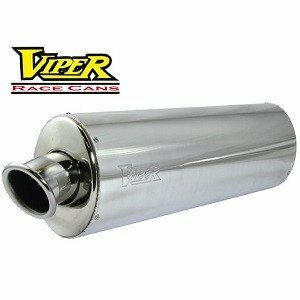 Viper Race Cans utilise optimum stainless steel internal components offering after market exhaust cans of unfaultering build quality. Oval cans are available in Alloy. 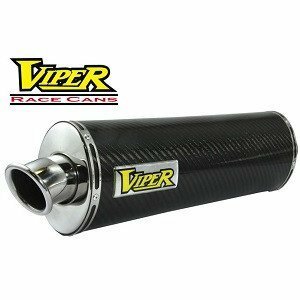 In addition to the increases in performance and styling, Viper Race Cans feature a low-down acoustic to bring a smile to any riders face. "Maximum power & torque - in style"
Round cans are available in Alloy. In addition to the increases in performance and styling, Viper Race Cans feature a low-down acoustic to bring a smile to any riders face. Carbon cans. In addition to the increases in performance and styling, Viper Race Cans feature a low-down acoustic to bring a smile to any riders face.